In my ongoing interest in unorthodox medical therapies, I recently enjoyed the edification of visiting a doctor of Chinese medicine. This fellow was actually Eastern European. But it’s confusing if I talk about a “Chinese doctor” who’s not Chinese. People are prickly that way. Anyway, after examining my pulse and my tongue (in various types of light), he gave me my diagnosis: I am profoundly short of Yang. Now, I’d like to say that this came as a surprise to me. I’d like to say that all the women in my life have been lying to me, and that I’ve been told for years that the size of my yang has never failed to impress. But the truth is that I’m a typical South Asian man with a wildly deficient yang…. …Oh wait, he was talking about something else. Never mind. Of course, I’m also mildly short of Yin. And I have… how did he put it…? “Dampness in my spleen.” Yes, dampness in my spleen. I don’t mean to make light of this very serious diagnosis, but I think I’d be more concerned if my spleen were dry. Something tells me a healthy spleen is a wet spleen. But what do I know? 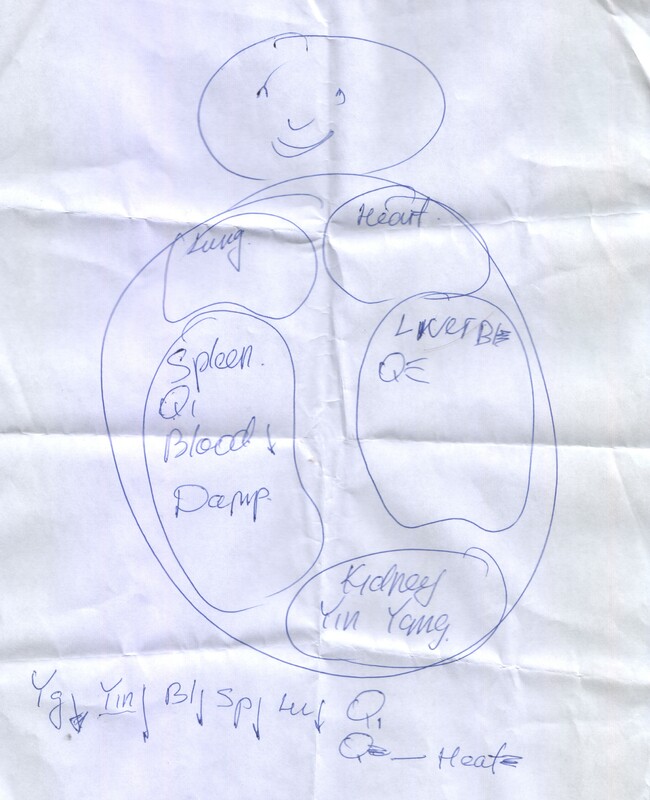 He left me with the following hand-drawn diagram, showing interesting locations of my internal organs. At the bottom is the notation for all that ails me. But most important is the smile on my face. Enjoy.